For a political campaign, you want something that people will use, others will see them using it, and potentially are a conversation-starter. There are a variety of custom political promotional products .You can customize the items with your own taglines and choose your own patriotic color. In the Political Campaigns there is a huge gathering of people. So to popularize a campaign or run it successfully your marketing strategy should efficient. If you are using promotional items to popularize your campaign then there are certain items which you can use as election Promotion items T-Shirts, pen and pencils, bottles and boxes, mugs, key chains and more. T-Shirts are the best and cheap promotional items which you can use for promotions and print your party logo on it and distribute it among the audience. 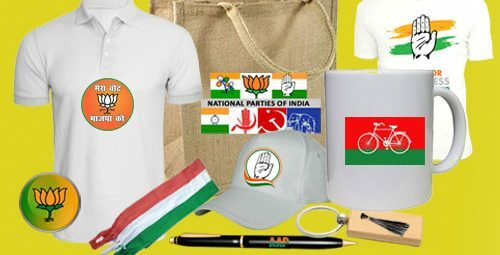 If you are organizing a rally for your political drive then prints T-Shirts also help in giving a great visibility to your brand. People also use pens and pencils for their brand promotion in the elections. Printing pens and pencils is also a useful item for drawing customer attention. You can also use Bottles and Boxes for the campaign promotion. Printing party logo on the water bottles and boxes is also a good strategy to aware the people. With so much to choose from, you can call us 9136794313 or visit our website Promotionalwears.com, so that we can help you find exactly what you’re looking for your so that your items arrive on time for your campaign.